HA NOI (VNS) — Newly opened roads in Ha Noi, dubbed "the most expensive roads on the planet", have hindered authorities' efforts to demolish odd-shaped houses. These roads in Ha Noi often cover a distance of less than one kilometer but cost hundreds of billions of dong for construction and site clearance compensation. A report by city authorities said in May this year there were 174 houses and land plots which do not meet building standards, with odd-shaped structures still not wiped out. An additional 442 super slim and bizarrely shaped houses have appeared on newly extended roads. The law on construction, which became effective in 2004, stipulated that land plots smaller than 15sq.m can not be built. Nearly 10 super skinny and distorted houses, many of which are only 2.5sq.m, can be seen along the 565 meter-long broadened Nguyen Van Huyen road section, with a total investment of VND696 billion (US$31 million). Another 10sq.m super distorted house, built on a triangle shaped land lot that has been narrowed from urban zoning, is surrounded by pieces of sheet iron, online newspaper Infonet reported. Also, about 10 oddly formed houses about 2.5m in length and less than 1meter in width near the Viet Nam Museum of Ethnology are utilised as open kiosks. On the second floor of these kiosks the owners expanded the house's area by one meter with reinforced iron, making them eyesores. Also on Nguyen Van Huyen Street, a 1.72sq.m wall, which remains after site clearance, has been advertised for sale for about VND1 billion ($44,500). Another of the "most expensive roads on the planet" in Ha Noi is an expanded stretch running from Tran Phu Street to Kim Ma Street, where incomplete wall destruction of roadside houses makes the street look untidy. A steering committee to clear away super skinny and deformed houses, directed by a vice chairman of the municipal People's Committee, was established in 2011. Meetings between districts' authorities and the city's leading officials were held monthly in a0n attempt to solve the issue. After two months, a series of difficulties hindered their efforts. The municipal department of construction issued documents as a basis for local authorities to reclaim land plots which do not conform to standards. These land plots will be used for public purposes, combined or renovated. However, many structures were constructed before March 15, 2015 with two or three solid floors where residents have settled down and run their businesses for years. It is very difficult to persuade them to leave, according to Infonet. A leading official from the department blamed the slow eradication of odd-shaped houses on slow work from the project's management board, adding that a lack of funds also slowed them. 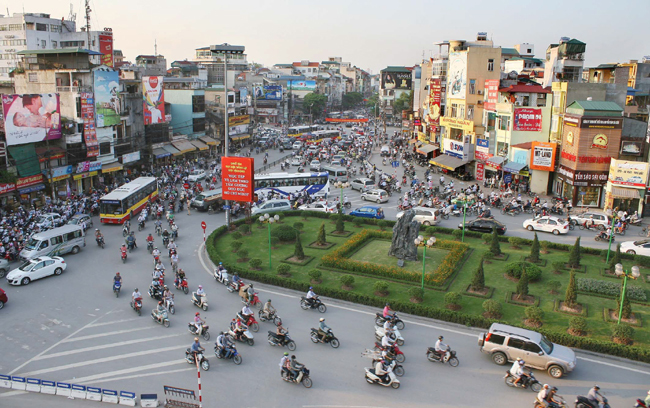 Associate Professor Nguyen Van Hung, former director of the Ha Noi Construction University, proposed that a scheme to renovate road sides must be conducted alongside road extension projects. He suggested that houses next to each other be combined to expand frontage through negotiations with local authorities and organisations. "The city's authorities should also offer reasonable policies supported by residents to eradicate deformed houses," he said.